A University of Reading undergraduate has won a top prize for her Law research project at this year’s British Conference of Undergraduate Research. 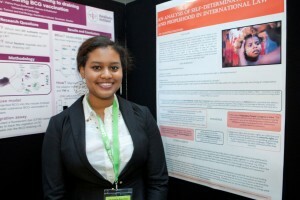 Chantelle Bacchus, 21, beat over 200 students from 51 institutions worldwide, including universities in Russia, Poland, Australia, Italy and the Republic of Macedonia. This year’s event included a total of 80 student talks and 94 research project posters over two days. A local divorce solicitors’ firm, Tony Roe Solicitors, continues to build on its existing links with the University of Reading with a series of visits to students. Last week, the School of Law welcomed Mr Roe once again to talk with the final year Family Law students. Only days away from final exams, the students worked on a practical family law problem aimed at building on their existing knowledge posed by the local divorce solicitor. They had to analyse a detailed case study and come up with their suggested order for a fictional couple. One student, Hettie Dunkley, commented, “The lecture was really helpful and well received”. Tony Roe said, “It is a great privilege to be invited by the School of Law to talk to the students. Local businesses get a lot out of working with the University staff and I would encourage more to do so. I continue to be impressed by the commitment of the staff and the performance of the students”. In addition to giving these talks to students, the firm gives an annual prize for the best performance in the Family law final examination.